This Chuck Klosterman sentiment from “Something Else” – an essay that starts off by discussing the reasons he appreciates AC/DC more now as an adult than he ever did as a 14-year old (short answer: “AC/DC was too real for me. I preferred artifice”) and then transforms into commentary on how his previous preoccupation with death has now flipped in the age of immediate (and extreme) eulogization after a celebrity dies (using last year’s passing of David Bowie and Prince as examples) – is a beautifully concise peek behind the curtain into the overarching worldview and writing style that Klosterman has employed in his ever-developing career as an author, writer, and journalist. His newest offering, Chuck Klosterman X: A Highly Specific, Defiantly Incomplete History of the Early 21st Century, is overflowing with these types of “existentialism via entertainment” dissertations as it collects a wide variety of his previously published pieces from the last decade and contextualizes them anew with updated introductions, footnotes, and unpublished passages. 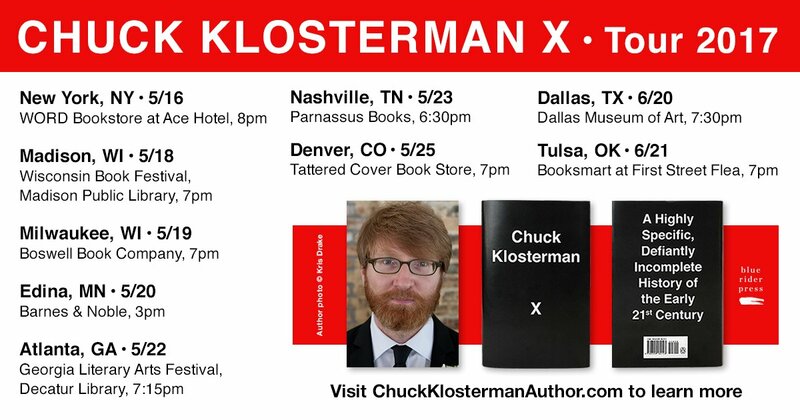 Much like his other celebrated essay collection releases, Klosterman reveals himself to be an incredibly adept observer at the larger implications that can be mined from analyzing the deceptively ephemeral elements of our era (from minutia to mass consumption), especially when it comes to music, sports, television, film, and our popular culture at large. Throughout the book, Klosterman showcases an impressive range of topics and subjects that he handles with equal proficiency. Whether he’s interviewing musicians (Noel Gallagher of Oasis, Jimmy Page of Led Zeppelin, Stephen Malkmus of Pavement), profiling popular athletes (Kobe Bryant, Tim Tebow), trying (in vain) to cover the unearthing of a 50-year old time capsule in Tulsa, trying (in vain) to get Tom Brady to talk about Deflategate, discussing the significance of television shows like The McLaughlin Group, The Walking Dead, Breaking Bad, The Wire, The Sopranos, and Mad Men, eulogizing Lou Reed and Jani Lane, satirically cataloging all of The Beatles albums, or writing a 10,000-word essay on KISS, Klosterman covers a lot of (seemingly) tertiary territory and (unquestionably) draws out the underlying elements of humanity that can make a story involving a non-descript 1988 basketball game between two North Dakota junior college basketball teams seem incredibly weighty and rich for examination. Of course, Klosterman is also just an incredibly engaging writer that can be read purely for entertainment purposes as well (and I mean that as the highest of creative compliments). I especially admire the way Klosterman approaches the past from purely non-nostalgic places. For example, when he was tasked with profiling Noel Gallagher around the release of his 2011 solo album High Flying Birds, Klosterman actually takes the opportunity to get Gallagher to have an in-depth discussion about Be Here Now, the maligned 1997 Oasis album that was self-admittedly fueled by so many drugs that cocaine should’ve been given a co-writing credit. Klosterman’s reason for his line of questioning is airtight: “When you like a band, you want to hear about the good times. When you love a band, you want to hear about the bad times.” So, instead of being an Oasis fan who wants to bask in the glory of the otherworldy success of their sophomore smash (What’s the Story) Morning Glory?, Klosterman is an Oasis fan that is far more interested in the follow-up faceplant of Be Here Now and how that shaped the band’s legacy and Gallagher’s future creative output. Klosterman’s swerve results in an incredibly entertaining (and quite informative) interview that show’s Gallagher weighing in on the difference between fame and success (“Fame is something that is bestowed upon you because of success. Success is something you have to chase.”), how the band’s trajectory takes on a different spin if you view their catalog in reverse, and how the idea of “perception” doesn’t discredit what the band accomplished at the beginning of their career. Using an American football analogy, Gallagher hypothesizes that if you come from behind to tie an opponent with two minutes left then you feel like you’ve won but if you were leading the whole game and your opponent ties with two minutes left then you feel like you’ve lost; however, it’s still just a tie either way. While being an Oasis fan may heighten the level of your own enjoyment regarding a piece like this, Klosterman’s angles and insights allow for multiple takeaways that don’t make familiarity with the subject a requirement. 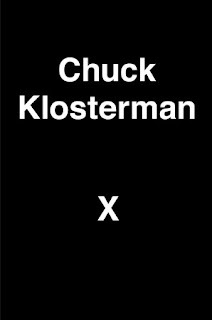 With almost 40 essays contained within it, Chuck Klosterman X almost guarantees to have a little something for everyone who has an even passing relationship with (or interest in) popular culture and the way humans interact with (and within) it. It doesn’t matter if he’s breaking down the difference between watching live sporting events versus DVR-ed ones (“We don’t crave live sporting events because we need immediacy; we crave them because they represent those (increasingly rare) circumstances where the entire spectrum of possibility is in play.”) or he’s trying to articulate his overwhelming personal connection to Charlie Brown (“I haven’t watched A Charlie Brown Christmas in at least twenty-five years, solely because I can’t emotionally reconcile the final scene: I can’t get over the fact that the other kids don’t tell Charlie Brown that his decision to pick the tiny, pathetic tree was ultimately the right call… This will bother me forever.”) or wondering if by not being well-versed in something as ubiquitous as the Harry Potter universe, is he “doomed to misunderstand everything else” that will transpire in future decades of popular culture when the “bookish kids reading Harry Potter… almost certainly go on to control the media”? (A point that shows up again in a footnote from his profile on Kobe Bryant: ‘But that’s not a universal thing. That’s like saying every wizard within Slytherin House is a villain.’ I pretend like this makes sense.”), Klosterman navigates cultural snapshots and the passage of time with an unbelievable level of intuitiveness, wit, and dexterity. Besides, until another writer comes along that can start a piece off with the challenge of attending a Creed concert and a Nickelback concert in the same night, discuss the differences between acceptably reflexive hate and the kind you have to justify (example: “If you criticize Dave Matthews Band within earshot of even one of their fans, you will be forced to justify every negative feeling you possess to the fullest extent of the law”), veer off into a relevant aside about the 1988 presidential campaign of Michael Dukakis, and then uncover what it means for two bands to represent the “most hated (yet popular) rock band” of one era and the “most popular (yet hated) rock band” of another, Klosterman’s got the market cornered. Despite this fact, we should always remember basic procedures and checks. In my opinion it is very important and vital. Thank you for the article published here.